Dengan Jargon "Murah Senyum", Muhidin Farid Bakal meramaikan PILKADA GUBERNUR KALIMANTAN SELATAN. Dengan visi yang sangat jelas yakni Menjadikan Kalimantan Selatan sebagai Gerbang Kalimantan yang Mandiri, Sejahtera, Religius, Beriman dan Bertaqwa, 2021 mereka optimis bakal mengantongi perolehan suara tertinggi di PILKADA nanti. Himax Pure 3 - After the success of Himax Pure 2, Himax Indonesia now back to bring other quality low price smartphone which is the successor series Himax Himax Pure Pure is 3. 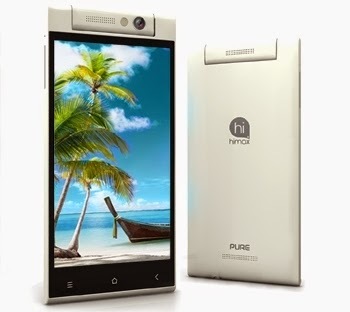 Smartphone comes with attractive specifications as well as a variety of interesting features. What are the advantages and what the price of Himax Pure 3? Himax Pure III carries a screen measuring 4.7 inches with a resolution of 720 x 1280 pixels and has a pixel density of 312ppi. IGZO screen type capacitive touchscreen, 16M colors and has a protective Dragontrail X Glass. 3 Pure Himax specification itself quite nicely for the price of 2 million smartphones. Mediatek MT6592 chipset using Octa-core processor 1.7 GHz speed paired with a Mali 450MP GPU graphics, 1GB of RAM and 16GB of internal memory. In addition to reliable specifications, Himax Pure 3 is also equipped with interesting features. One of them is the main support 13MP camera that can rotate up to 200 degrees as yours Oppo N1. Practically, this camera can be used for the front and rear camera. Himax Pure III is marketed in a way to pre-order through the official website of Himax-Indonesian. Price Himax Pure 3 alone is priced at Rp2, 5 million alone. Some of the advantages that exist in Himax Pure 3 among others, reliable octa-core processor and Mali 450MP GPU, the price is quite cheap, 13MP camera that can rotate the screen and slick. While the lack of Himax Pure 3 among others, there is no microSD slot and a battery that is not removable.